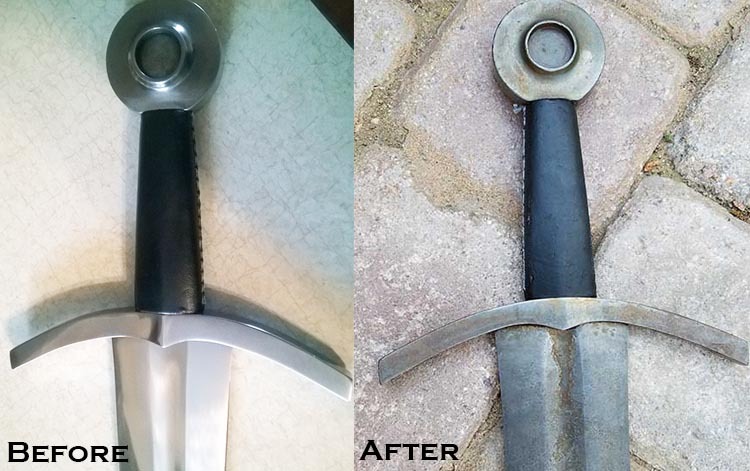 It is not that hard to patina a sword - after all, most collectors of functional swords do everything in their power to PREVENT their sword from rusting. 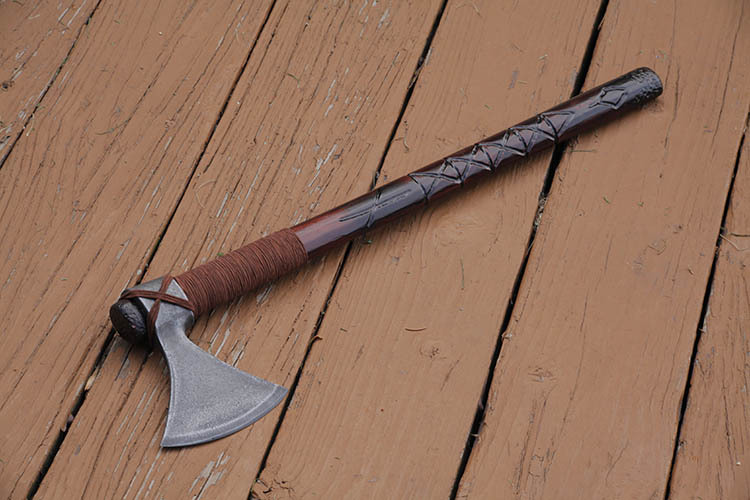 But we aren't talking about putting some black or red spots here and there - we are talking about taking a nice shiny new sword and making it look like it was forged 500 years ago..
To patina a sword - the very first thing you will need is, of course, a sword to patina.. And preferably a cheap one.. Anyway, aside from the sword all you need is some vinegar, some salt and some time.. 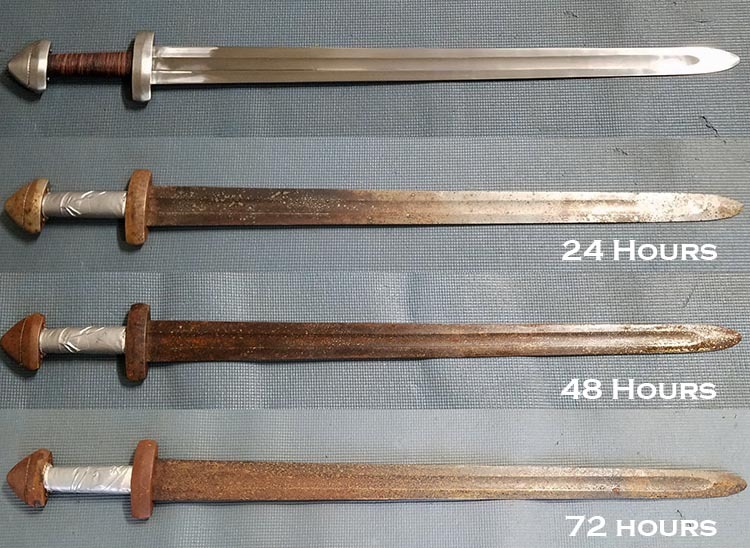 The basic recipe for antiquing swords is a pretty simple one. Just take a spray bottle (like a hairdresser uses) and fill it up with vinegar and a fair amount of salt (there is no specific formula, just a good mix so that the salt largely dissolves in the water). Shake the spray bottle up and give the sword a spray, leave for a couple of nights and see how it progresses. It should start to bubble a bit with red rust marks. Apply more as desired and after a few days, lightly remove the red rust with a scotch brite pad and viola - instant antique and patina, making a modern replica look several hundred years old in a few nights. 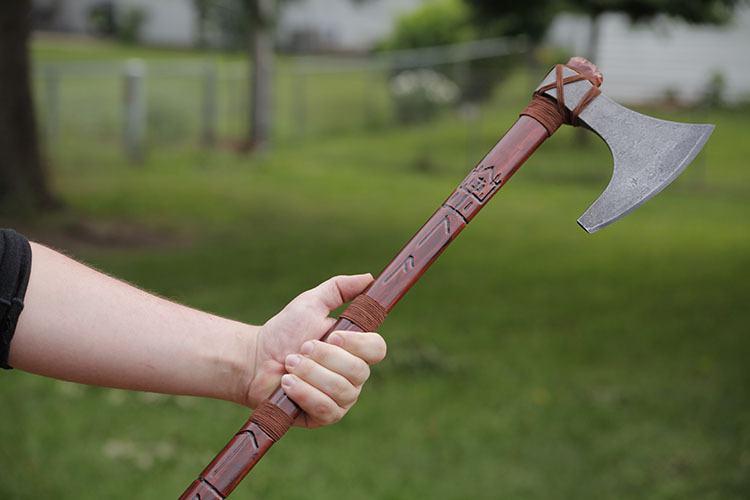 Here's how one of our members did it with a cheap Deepeeka Viking sword. The 4 panels represent the sword at the beginning of the process, and then 24, 48 and 72 hours of white vinegar + salt spray. After each day of aging, the surface grunge was wiped off to expose new pits and discolorations before respraying. a few hundred years in a few days..
For an even better effect, this particular sword was then buried in a 'shallow grave' of wet soil for three days, and on the third day..
To refine the antique and give it that 'museum' look - a solution of baking soda and water will neutralize the acid in the aging process, stopping the rusting. To clean it up use WD-40 with a very mild abrasive such as 000 steel wool. Very fine sandpaper with the oil also should work (1000 grit). If that’s too fine try the next coarser grit up. 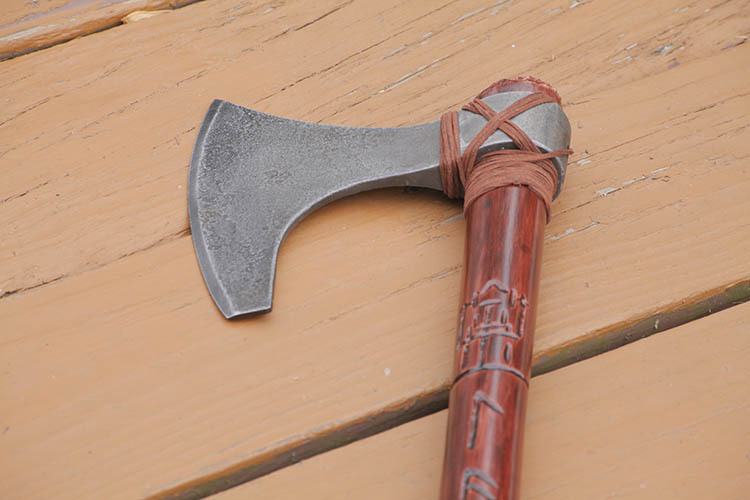 This technique is a variation on the first, and was used on the Windlass Oakeshott sword at the beginning of this article. First, any protective oil or grease is wiped off - then several minutes of hard shaking in a big plastic box full of rocks and 16-penny nails. Then three hours bathing in warm water mixed with white vinegar, apple cider vinegar, lemon juice, regular salt, and potassium ("lite") salt. Ten or so removals, pat-downs, and brief air-dries during the bath. Then several days sitting out a damp area outdoors to let the patina cure - don't wipe it down too soon or the pattern will come off. The sword below sat around for three days, and when the patina was wiped off with some cloth and mineral spirits it revealed this cool looking faux Damascus/wootz-ish pattern remained. 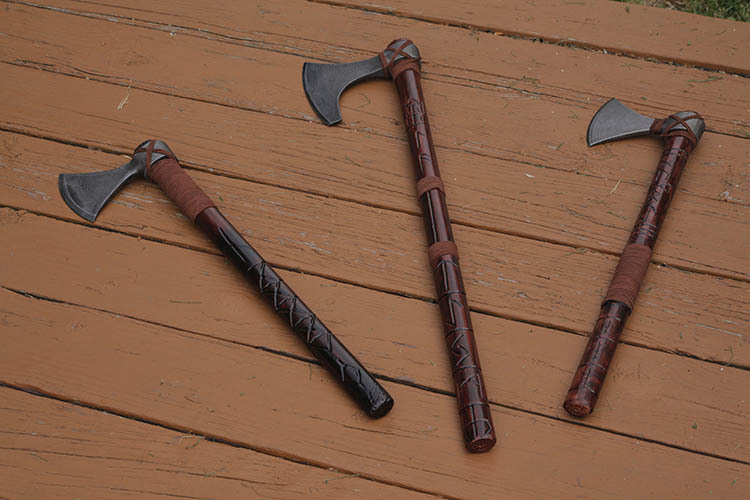 Below is a small gallery showing results using the same technique on an Axe (click on any image to enlarge and open the gallery). Bonus Section 2 - "Chinese Mustard Patina"
What exactly is 'Chinese Mustard Patina" I hear you ask? 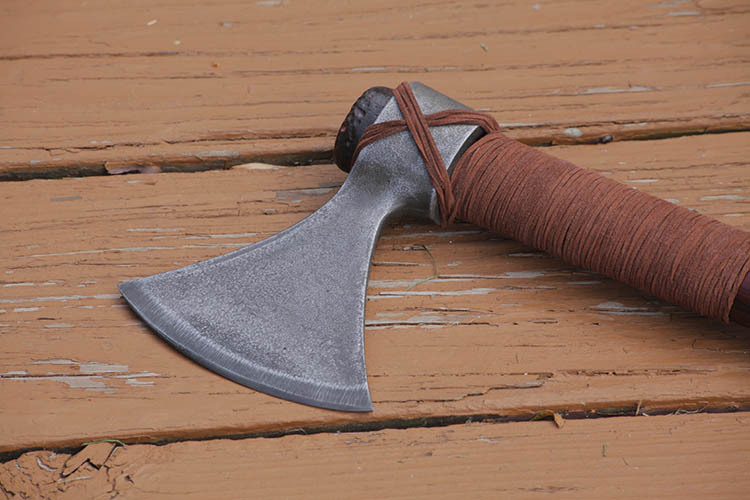 Well it is one very unusual way some SBG members use to patina a sword, axe or knife to get a different effect like this.. This patina makes the steel pretty much rust proof. 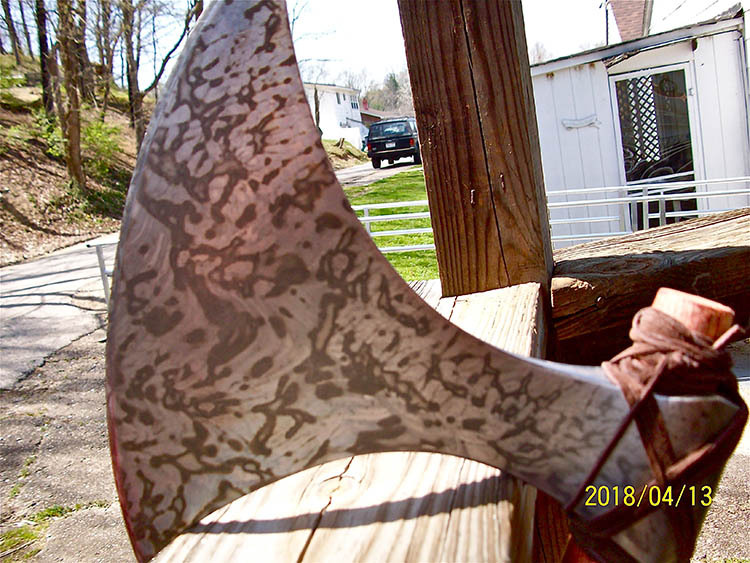 When I first did this, I did not expect it to be such a good rust blocker, but I have this finish on several weapons and I've NEVER seen any rust or discoloration on any steel treated in this manner. I use the mustard from packets we get when we order Chinese food. This is Chinese style hot mustard. I smear the mustard on the metal, then take a paint brush and "paint" the mustard on the steel. Then I use the brush to dab the metal with larger globs of mustard. Each mottled area is where the mustard is placed thickly. It took me a few times to get my technique down. On this axe, I left the mustard on all night. The next morning, I placed the axe head in a sink of soapy water, let it soak for a while, and scrubbed the dried mustard off with a sponge. The pattern is pretty much up to how you daub the mustard on. If you are very skillful, I'm sure you could get something like a pattern welded steel appearance. That's what I was shooting for. I've used other types of mustard, but nothing works as well as the hot Chinese. There aren't any videos or tutorials for how to patina a sword on YouTube, however there is a good one on how to Patina a knife in a few hours by immersing it in boiling water and vinegar (harder to do with a sword obviously, but the basic principles remain the same). 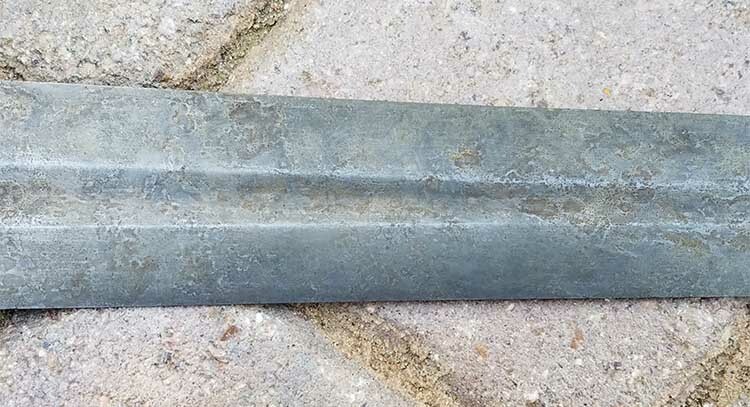 The video also demonstrates that a blade that has a patina is still perfectly functional - though you will probably want to touch up the edges again a little (click here to learn several sword sharpening methods). 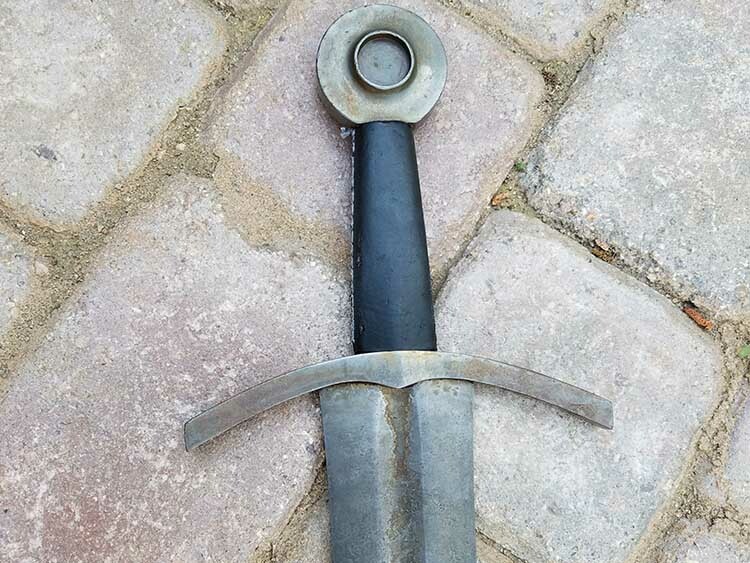 For more information on antiquing swords - including the wooden components, brass, etc the article the instant antique at MyArmory is an excellent and recommended read.